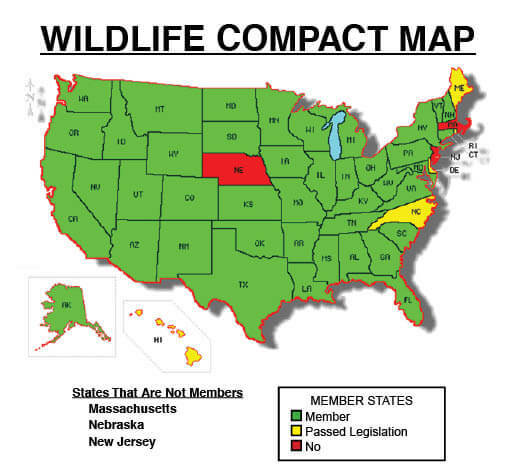 The South Carolina Department of Natural Resources formally entered into the Interstate Wildlife Violators Compact (IWVC) with 38 other member states on July 1, 2012. As a compact member South Carolina has agreed to treat nonresidents from member states as if they were residents for purposes of hunting, fishing, trapping, and wildlife violations. However, the compact does not cover boating violations. If a nonresident from a member state violates a wildlife law in South Carolina, DNR officers can now serve a courtesy summons under the terms of the compact rather than arresting the individual, or requesting a cash bond. Likewise, South Carolina residents will be treated the same way in other member states. Residents from member states are granted a courtesy summons based on the understanding that they will comply with the terms of the summons. If a resident from a member state fails to comply with the terms of a courtesy summons issued by another member state they will be suspended by their home state and that suspension will be recognized by all other member states. As a member of the IWVC, South Carolina will share nonresident violation information with other member states. This means that illegal activities in one member state can affect the privileges of the individual in all member states. South Carolina will now recognize the suspension of hunting, fishing, and trapping privileges from other member states. A person who is under hunting, fishing, or trapping suspension in South Carolina will be prohibited from obtaining licenses in other member states, and South Carolina will deny licenses to nonresident individuals from member states who have had hunting, fishing, or trapping privileges suspended by that state. South Carolina will recognize the suspension of hunting, fishing, and trapping privileges of member states as if the suspension had occurred in South Carolina.